Kalighat Kali Temple is a renowned shrine that observes hundreds and thousands of devotes every year. Located at Kalighat in Kolkata, the temple can be easily reached by the means of local transport from the city. In the southern part of Kolkata, Kalighat is a small locality that is well-known for its Kali temple. Kalighat Kali Temple is considered as one of the 51 Shakti Peethas of Shakti. Goddess Kali is regarded as the most complex goddess of the Hindu pantheon. Usually depicted in a fearful form, Kali is the destroyer as well as the liberator. Goddess Kali, in her wrathful form, is worshipped by thousand of devotees, who come all the way from distant parts of India and the World. The temple attracts a major portion of visitors to Kolkata. Kalighat Temple is an important religious place for the followers of Hinduism. As per the legends, the different body parts of Sati fell on the earth at the time of self-sacrifice. It is believed that the right toe of Sati fell here and subsequently; the temple was erected to commemorate the Goddess. Goddess Kalika is the presiding deity in the Kalighat Temple. Another legend says that once a devotee saw a bright ray of light impending from Bhagirathi River. He located the light and discovered a piece of stone in the form of a human toe. In its vicinity, he also found a 'Svayambhu Lingam' of Nakuleshwar Bhairav. He placed the images in a small temple and started worshipping them in the forest. The popularity of the temple grew with the times and it got the recognition of Kalighat Kali Temple. The present structure of Kali Temple was constructed about 200 years ago. In 1809, Kalighat Kali Temple was built by Sabarna Roy Chowdhury of Barisha. 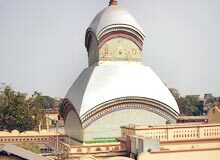 Kalighat Temple has been often referred in the texts like Mansar Bhasan of 15th century. The original temple was built by Raja Basanta Roy, who was the uncle of Pratapaditya and the King of Jessore (Bangladesh). The original temple was sited on the banks of Hooghly; however the river has shifted away from the temple with the period of time. In the past days, traders used to take stop at Kalighat to pay their obeisance to Goddess Kali. Situated on the banks of Adi Ganga, the temple has a sanctum sanctorum in the company of a huge hall by the name of Nat Mandir. In the north-east of this sanctum, there is a Shiva Temple. There is one more shrine dedicated to Radha Krishna. The main attraction of this temple lies in the image of Goddess Kali that bears a long protruded tongue made out of gold. The main shrine comprises the image of Goddess Kali. The image of the deity appears incomplete. On the initial level, the face of the goddess was made and further tongue and hands made of gold and silver were added to the image. On the day of 'Snan Yatra' (Bathing Ceremony), the priests cover their eyes with cloth strips, while giving the ceremonial bath to the Goddess. Festivals like Kali Puja, Durga Puja, Poila Boishakh, the Bengali New Year day and Sankranti witness huge number of devotees at the temple with offerings.